As this short week draws to end, families from everywhere will unite for what should be the happiest time of the year. Here at S&A Homes, we simply want to use this time at the end of the year to thank our fellow team members, our vendors and, most importantly, our customers for a successful 2013 year. 2013 was an important year for our company thanks to our continual commitment to building high-quality, energy efficient floor plans without sacrificing our customer-focused attitude. • S&A earns a 98 percent Customer Referral Rating, one of the highest in the entire home building industry. They don’t call them the Housing Excellence Awards for any old reason. Excellence, by definition, refers to a standard that is pretty tough to beat. That’s why we are more than a little proud of the 2014 Housing Excellence Award we received from the Builders Association of Metropolitan Pittsburgh. The award was bestowed upon our Cottage Premiere Model home that is featured in Venango Trails, part of Marshall Township’s most sought after community, for Best Green/Energy Efficient Home of the Year over $500,000. The Salvation Army – its name is synonymous with the holidays, goodwill and reaching a hand out to our neighbors. 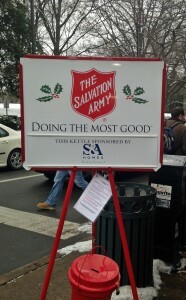 At S&A Homes, we are a big supporter of the Salvation Army, and today until 7:00 p.m. we will be braving the elements to man the pot at the corner of College Avenue and Allen Street in downtown State College. How much do you love holiday decorating? This is the time of year to go all out and put your decorating skills on display for friends, family and neighbors. Whether you focus on a glitzy tree, a Griswold-inspired front yard or some simple holiday accessories, we want to see how you decorate for the holiday season! That’s why we created the S&A Home for the Holidays contest. Now through December 26th, we want to see pictures of your home decorated for the holidays! On December 27th, we will announce the winner, who will receive a $100 gift card simply for posting a photo or two.